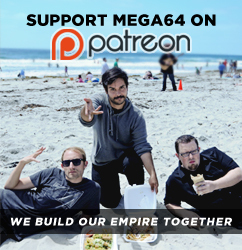 MEGA64 PODCAST 468 THROWS A STRIKE!! This week's podcast is another gimmicky kind of show, but we have a reason... You see, we're kinda... between studios right now. That's right- the usual Mega64 base of operations has been shut down. Where will we end up? Who knows... but until we do... let's go BOWLING! This week we hit the lanes and talk about Dragonball FighterZ, Jumanji, anime raves... and maybe a pizza. Watch below or get the audio version here! As we mentioned, we're between stuff right now so please pardon our silence and lack of videos... we will be back in full force very soon. In case you missed it, we also resurrected the Neuro shirt. Don't miss out on this returning gem again! There's also one day left to get in on our next set of Patreon rewards! Jump in, get some extra content and get some gifts!